What does displacement look like? The UNHCR estimates there are 68.5 million forcibly displaced people worldwide: 40 million internally displaced people (IDP); 25.4 million refugees; and 3.1 million asylum seekers. There are also an estimated 10 million stateless people, or people who are denied nationality. In these terms, “displacement” means someone who is forcibly moved or removed due to armed conflict, violence, human rights violations or natural/human-made disasters. Displacement mobilizes CWB into action because our tours respond to people experiencing crisis. When a project partner asks us to come share laughter, we do our best to oblige. But as global politics shift and change, late-20th century and early-21st century displacement has started to take on a distinct quality: protraction. Thanks to our news cycle in the United States, it’s easy to picture acute crises like earthquakes or bombings. It’s more difficult to conceptualize protracted displacement caused by intersecting problems like lack of water resources due to agricultural mismanagement and climate change, or civil war resulting from the legacy of colonialism. The UNHCR defines protracted displacement as displacement for five years or more, yet from 1974–2014 fewer than one refugee crisis in 40 was resolved within three years. In fact, more than 80 percent of all refugee crises lasted for 10 years or more. How does CWB respond to protracted displacement? CWB frequently interacts with communities experiencing protracted displacement, including our 2018 tours to Colombia (Coastal Tour and The Department of Cauca), Lebanon and Myanmar. The media image of refugee camps does not reflect reality for many people experiencing protracted displacement. It’s an increasingly urban and dispersed phenomenon, with (in 2015) at least 59 percent of all refugees living in urban settings. The increasing frequency and length of protracted displacement results in migrant and IDP situations that challenge preconceived ideas of what a crisis looks like. For example, many refugee camps are essentially settled, with established systems of support both formal and informal. But does that mean people no longer live in crisis? What kind of role does laughter and levity play in situations that feel intractable instead of sudden? 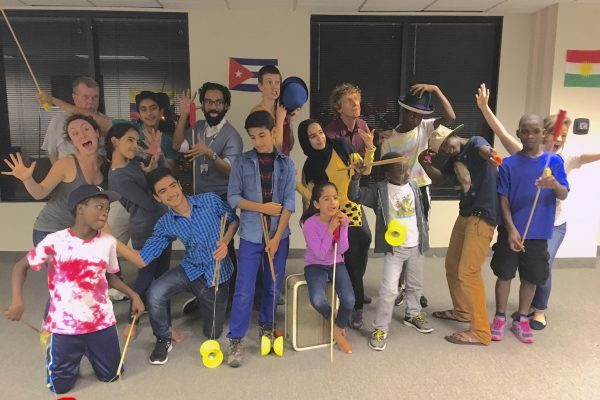 We’ve found that, along with planned performances, CWB tours help carve out space for communities to come together over joy. Communities constantly build their own resilience, but play and silliness help reinforce an opportunity to forge connections within protracted displacement. June 1st marked the official beginning of Puerto Rico’s hurricane season. This is an annual cycle on the calendar. However, many of many of our fellow U.S. citizens in Puerto Rico are still reeling from last year’s hurricane season. They have gone 10 months without power. The long term damage from Hurricane Maria is mind-boggling. Approximately 1,000 homes remain without power on the island, while Puerto Rico’s electric utility company, PREPA, struggles to find a CEO. In the ongoing battle over electric power administration on the island, Governor Ricardo Rossello recently signed a bill to privatize power generation but retain government control over its distribution. The infighting and instability is felt by the thousands of people who still don’t have reliable power. In February, CWB – USA performed for many of these communities. Their rebuilding process was in limbo thanks to the politics of getting the lights back on. Thousands of Puerto Ricans who emigrated to the mainland U.S. say that they may never return. The lack of economic opportunities on the island, coupled with the slow infrastructure recovery, have forced people to permanently uproot their lives. CWB – USA was founded to bring levity and laughter to children in international crisis zones. By our own definitions, touring to Puerto Rico in February was a domestic project in response to a natural disaster and immediate crisis. However, with the continued lack of power, the situation is morphing into one of protracted internal displacement and emigration. Those who remained on the island in the aftermath of the Hurricane Maria face ongoing trauma and potential economic ruin. The displacement is ongoing, long after the hurricane passes. But now, with a new season looming, the impact of a storm has the potential to be even worse. While the mission of CWB – USA may be simple, we embrace the complexity of the crises faced by our community partners. Even now, as we plan a return tour to Puerto Rico, to continue the healing process from Maria, we know that the island may be impacted by another hurricane. CWB – USA is proud to share laughter with people around the world, and at home. We are inspired by the resilience of the Puerto Rican people, as they face the daunting task of rebuilding. 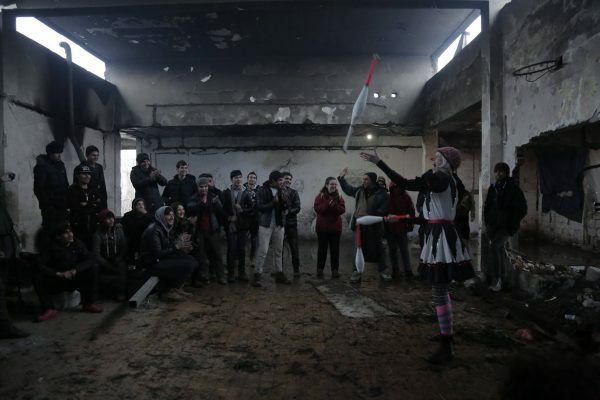 What do you get when clown-delegates representing fifteen countries meet in a medieval, Catalan village at an event modeled after the United Nations? 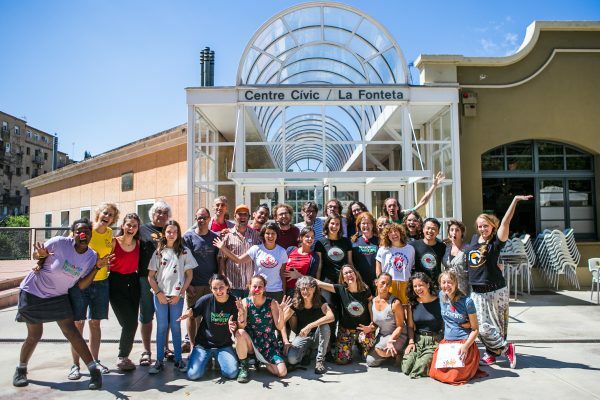 Why, the Seventh Annual General Assembly of Clowns Without Borders International (CWBI), of course! For four rowdy, music-filled days, we met around a large conference table to discuss the organization’s future and how to respond to emerging and protracted displacement. CWB – USA Executive Director Naomi Shafer recently returned from this year’s assembly, to report back on what she learned. What is Clowns Without Borders International? There are fifteen chapters of Clowns Without Borders. 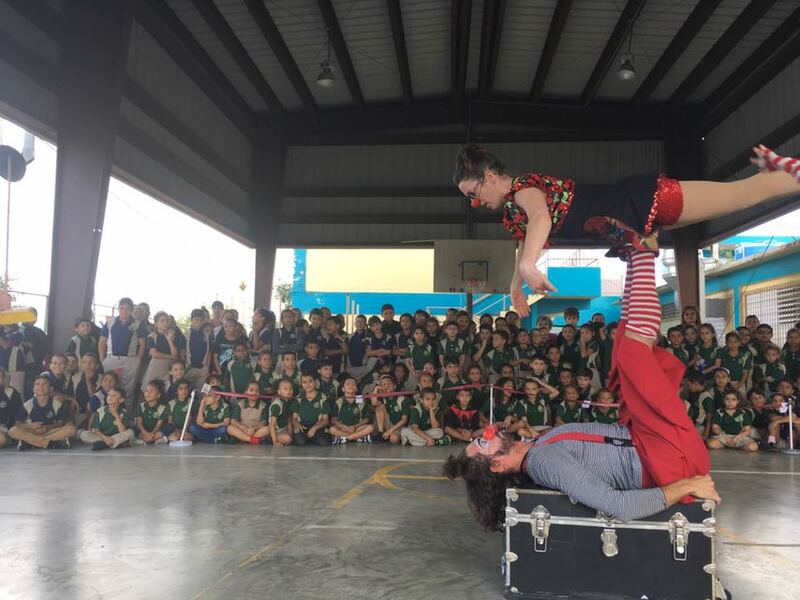 While each operates independently in their own countries, they also share a vision and common goal under the umbrella of Clowns Without Borders International. Each chapter has a representative on the CWBI board, and once a year the representatives come together for an annual meeting. 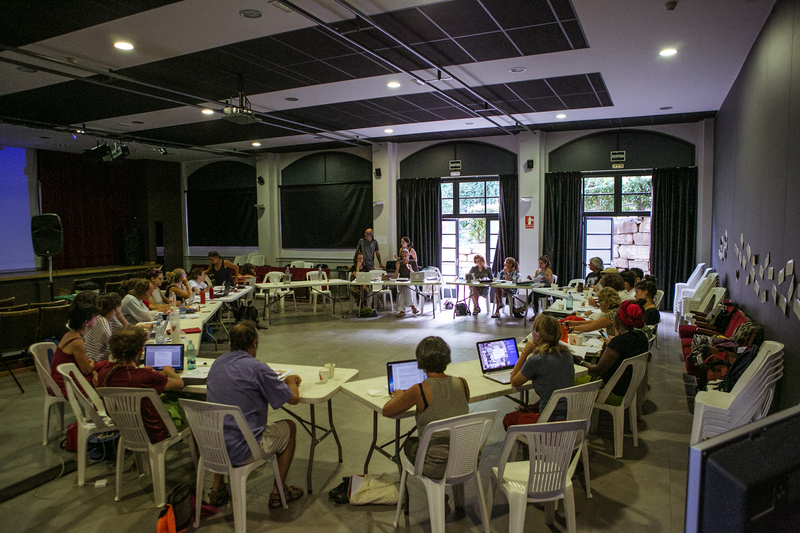 This year’s meeting was held in Caldes de Montbuis, a town in Catalonia, Spain. It was a joyous event, with thirty clowns (and clown administrators) coming together to discuss the organization’s future. With this frame, we started to discuss the changing landscape of displacement, and how CWBI—and each of its member chapters—can meet the current needs of displaced people. All chapters share two values: We only go where invited, and we always work in partnership with a local organizer. One of our longest group conversations was about how to build on this framework to increase the diversity of each performing team, CWB chapter, and CWBI, overall. 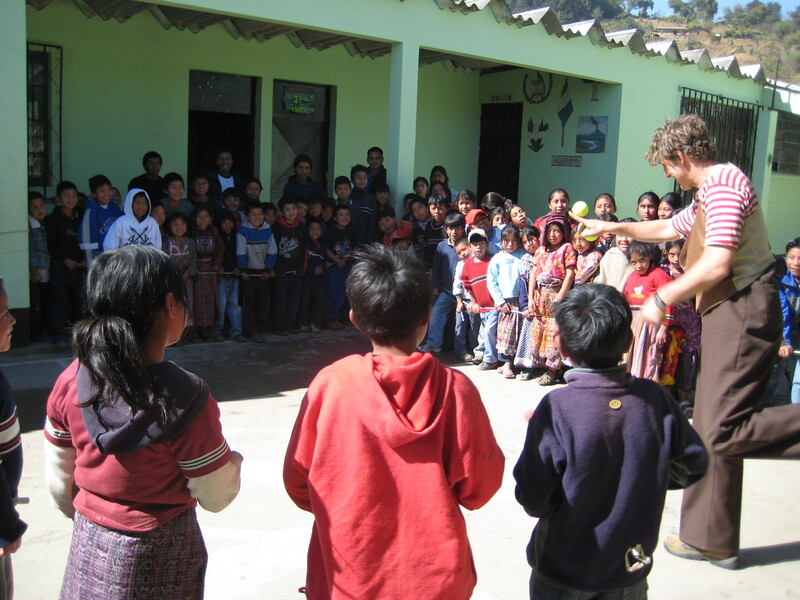 CWB – USA prioritizes partnerships with local artists as a way to increase the impact of our work. In addition to setting long-term policies, the General Assembly is an essential opportunity to meet the leadership of other Clowns Without Borders chapters. All of our project collaborations are a result of forging these personal relationships. Partnering with other chapters (such as on our recent tours to Mexico, St. Maarten, and South Sudan), is an invaluable way to increase our impact and learn from each other. 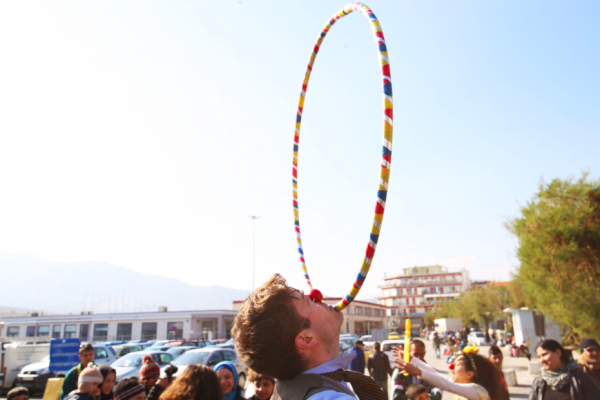 Want to know more about Clowns Without Borders International? Visit CWBI’s Website. Welcome to an ongoing blog series of contributions by CWB – USA’s wonderful board members! Erin Leigh Crites, Vice President of Clowns Without Borders USA, is an international theatre artist, educator, and purveyor of make believe. In the past ten years, Erin has traveled extensively to explore the global community and create bonds through theatrical play. 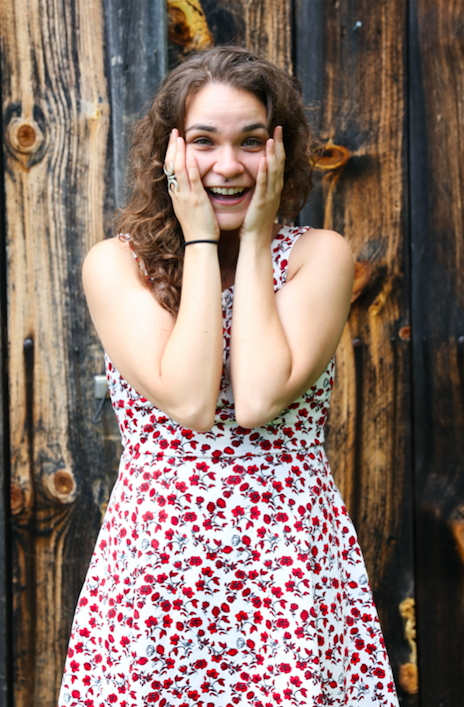 She splits her time between Los Angeles and Idyllwild as an ensemble member of Fiasco! Physical Theatre and a full-time instructor in the theatre department at the international boarding school, Idyllwild Arts Academy. She joined Clowns Without Borders in 2010 after receiving her MFA in physically-based ensemble theatre from Dell’Arte International. When I was a child, people frequently told me I was too sensitive. Too shy. Too worried. I had a hard time relating to other kids. I was always asking questions that nobody cared about, taking an interest in global things, rather than local. I even developed insomnia by age 11, because I was worried about world conflict: Israel and Palestine; Northern Ireland; India and Pakistan. These issues of the 90s kept me up at night. And I cried. A lot. I cried because I felt helpless. I was too small. The problems and people were far away, but I felt them so intimately. I felt like my heart was constantly squeezed by a world unable to listen to its own need. I couldn’t articulate that at 11 years old. I was just a kid with no power, surrounded by kids who thought I was weird for caring. I felt like that a lot. Weird for caring. I still do. Watching people interact, I would think, “Aren’t there bigger things to worry about?” Or, “I don’t think you’re even listening to each other.” I didn’t know what all of that meant, or how it would manifest in my sense of purpose, until after I pursued physical theater at Dell’Arte International. I had never taken a dance class or moved my body in expressive or dynamic ways, other than through sports, until I went to Dell’Arte at 23 years old. During my audition, I was told to “just sit and speak,” because I was trying so hard, and failing, to be physical. When I just sat and delivered my autobiographical piece, I connected. It was because I was talking about the need to connect with others. I was on fire about the power of theatrical expression to unite people through imaginative play, through the creation of an interpersonal feedback loop. And I realized that if there can only be one lesson, it’s listening. I need that loop to look deeper into myself. I need to connect. And listening allows me to connect to others and to myself. Flash forward through three years of rigorous physical theatre training, including clowning, and I met Adrian. Adrian Mejia was a graduate of Dell’Arte and a performer for CWB. We had one of those beautifully wandering late night conversations that ended with him telling me, “You know, listening to everything you’ve said, I really think you should go on a Clowns Without Borders tour.” I didn’t know anything about the organization, but I lit up inside as he continued to describe the work. I’d like to take a moment to honor Adrian’s memory. He was a bright light in this world and the catalyst for my work with CWB. When I heard of his passing, a fire was stoked in my innermost being. I emailed Clowns Without Borders again. I had already submitted my application, but now there was urgency. During a phone call with Dianna Hahn (who I believe was program director at the time) I was asked if I had any preferences about where I’d like to travel. “Nope,” I said, “just the next available position. I just need to go.” The conversation ended with her telling me that all of the trips in the near future had been filled, but that she would keep me on CWB’s radar. This felt like an important step, and it was. My first CWB trip to Haiti, in 2010, changed everything. I found a deep resonance, an echo of my childhood self. That lonely, only child, who wanted to connect with the world, stepped into the lives of the people she had worried about in the middle of the night. I was no longer helpless. I no longer felt too small or that the problems were too far away. In fact, the problems themselves dissolved in favor of connection with the very people who remained resilient against them. Connecting to an individual magically lifted the crushing weight of trying to “solve” the global problems squeezing my childhood heart. That’s how connection through laughter operates. The word levity comes from the Latin levitas which translates to “lightness.” If I can connect with one person at a time, through laughter, we all get lighter. And it doesn’t matter how short the interaction is or how small my contribution seems, compared to the grand scheme of the universe. When the nose is on, I am on, and my soul/sole purpose is to connect. Welcome to a new blog series, with contributions by CWB – USA’s wonderful board members! Board member Tim Cunningham is a graduate of the Dell’Arte School of Physical Theatre (’01) and has performed with CWB in 11 countries outside of the United States. Within the borders of the US, Cunningham has performed, lectured and facilitated workshops about CWB’s mission and work at universities and high schools. He received his doctoral degree from Columbia University’s Mailman School of Public Health. Board president David Rosenthal is currently an Associate Professor and the Director of Management Programs in Health Policy and Management in the Mailman School of Public Health and a behavioral faculty member in the Center for Family and Community Medicine, Columbia University. If you read anything about hospital care nowadays, specifically about physicians and nurses, you’re likely to read about B.O. No, not body odor, but burnout! It’s a major issue, and unlike body odor it can be contagious. If you want to read some journal articles, search for names like “Dyrbye, Shanafelt and West.” (Here’s a good one.) Burnout is nothing new and as with many things, interest in its effect ebbs and flows. It was popularized in the 1970s by Herbert Freudenberger, and in the early 1980s, when Christina Maslach helped define our current understanding of burnout. Now, we find ourselves talking about the same thing as though it’s a new crisis. Burnout also occurs in the military and can be related to Post Traumatic Stress Disorder (PTSD). In fact, the New York Times Magazine recently published a haunting but important read about rates of burnout among some of our nation’s drone pilots. The story highlights people who work out of remote offices, limiting their interpersonal connections. If you want to do a deep dive into medical research, nursing research, and military research, you’ll find lots of papers about the prevalence of burnout and PTSD. You’ll find far less conversation about what we can do about it, and how it can be treated. Honestly, we social scientists are pretty good at measuring the existence of something, but it’s more difficult to study interventions and create evidence-based strategies. So what does all of this have to do with clowns? We’ll tell you. Clowns Without Borders just might offer a unique tool to fight burnout and make PTSD a little less painful. It’s neither costumes, nor magic tricks. It’s not our acrobatic routines or the famous “newspaper bit.” Nope. It might actually have little to do with us and more with how clowning brings people together. Lots of papers (including one that we published) scramble to understand how we can treat burnout or PTSD. One common thread is that people with a sense of camaraderie fare better when it comes to these two phenomena. Nurses who treated patients together during the Ebola outbreak, physicians who worked in a refugee setting in Greece, soldiers who fought with people they know and trust, all report a stronger ability to deal with life’s stressors. Drone pilots, on the contrary, find themselves working alone, thus losing all sense of camaraderie. That loss can rip people apart, emotionally, when they go through traumatizing experiences. Many people struggle with PTSD once they’re no longer surrounded by a team with similar experiences. The power of relationships and social support, as a healing and coping tool, cannot be minimized. During CWB tours, which most frequently focus on the needs of a community in crisis, these relationships are highlighted and celebrated. CWB clowns set a stage, wherever that stage needs to be, and they welcome anyone who can squeeze into the audience space. Sometimes our shows are for 10 people, sometimes they’re for 1,000. When CWB clowns set a stage, people gather. People who have been ripped apart by governments, by war, by poverty and by disease, sit, stand, and play with us. People who have been forced to migrate from their homes or forced to move from their neighborhoods and their social supports, have an opportunity to connect. In that togetherness, people laugh. 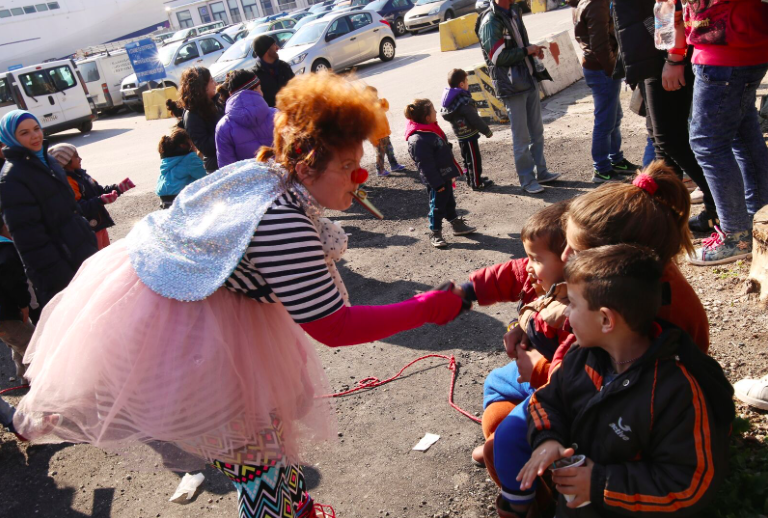 Children laugh at the clowns, parents laugh at the children laughing at the clowns, and the clowns laugh at refugee camp guards who often laugh along. Spending time together begets camaraderie, which begets mutual trust—laughter is icing on the cake. As for our claim to “cure” burnout and PTSD…well, our work is really more of a balm, a treatment for emotional wounds. But that’s just one of clowning’s many ethical interventions that can help our brothers and sisters along their own journeys towards healing. As for the “common cold” claim, some suggest that social support and relationships (and possibly chicken soup) can make a difference! When are you going to Texas? Should I just get in my car and drive to the camps? What can I do to support these kids? These types of inquiries have flooded our inbox for the past few weeks. We try to answer some questions here, knowing full well that for many, our answers may be unsatisfactory. Why aren’t you performing for the children who have been separated from their parents? Children who are currently held at temporary camps in Texas (and elsewhere) are under the jurisdiction of U.S. Customs and Border Protection. Access to the children is limited to CBP personnel and legal counsel. Even the American Red Cross has been denied access, making the camps more impermeable than refugee camps in warzones. CWB – USA does not have access to the camps. If we are able to make contact, and are invited on a tour, we will go. When are you going to Texas? We have been in touch with Refugee Services of Texas, a former project partner, for the past few weeks. Refugee Services (in Texas and every other state) works with refugees, including undocumented minors, who have refugee status within the U.S. In November 2016, CWB – USA toured to Dallas, Texas, and performed for members of these communities. 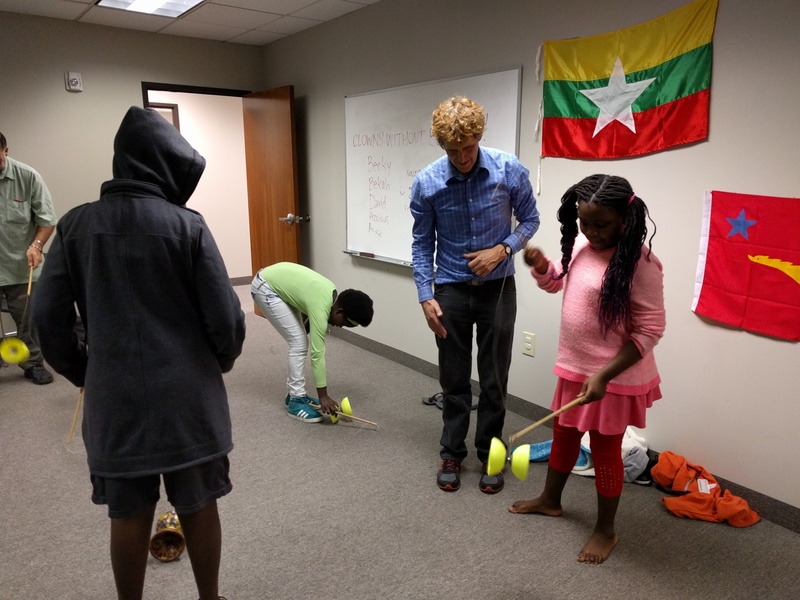 The three-person team taught physical theater and circus to three different groups within the refugee community in Dallas. 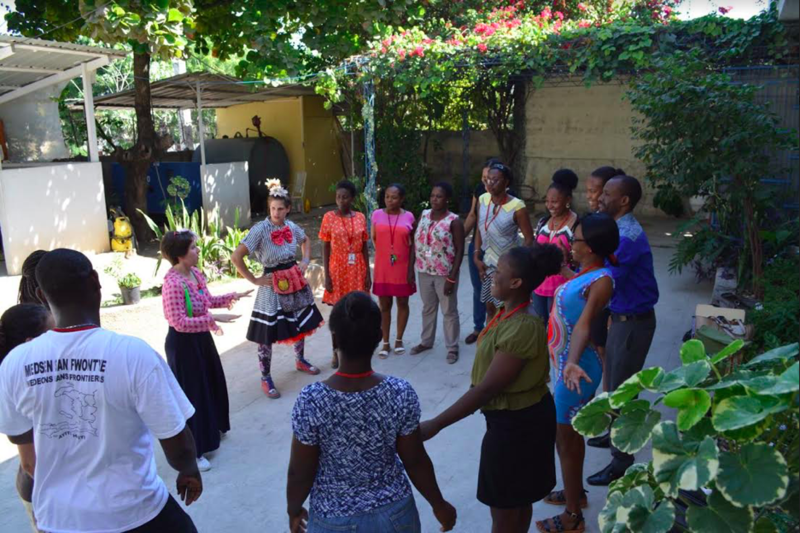 The tour’s second focus was to help adolescents and adults work through language barriers and connect through physical movement and play. Dallas receives a high number of refugees, mostly from Syria and Congo. CWB – USA has also led multiple tours at St. PJ’s in San Antonio, Texas. St. PJ’s houses children who are victims of abuse and neglect, and its International Program is a government-funded, Health and Human Services approved, facility that cares for a large number of unaccompanied migrant minors. 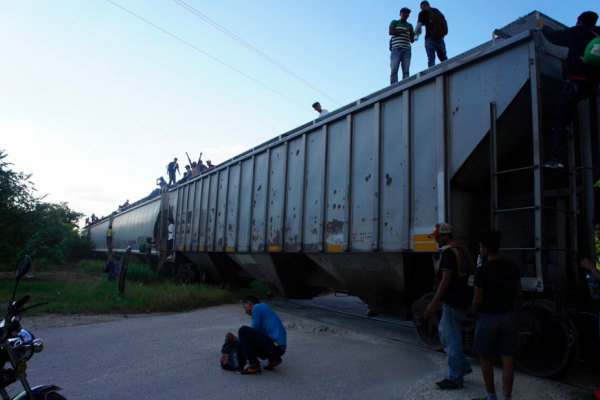 These children have crossed the southern border of the United States, fleeing unspeakable violence in Central America. They reside at St. PJ’s while awaiting their court dates, deportation proceedings, or entrance to the foster care system. We hope to return to Texas this fall in partnership with Refugee Services of Texas. Should I just get in my car and drive to the camps? One of CWB – USA’s core values is to only go where invited, and to always work with a partner. For us, filling a van with clowns and driving to the camps would be outside of our Code of Ethics. Having a partner and an invitation is essential for the safety of our team and our audience. We welcome an invitation from Customs and Border Protection, and also any local organization working with refugees within the U.S. Sometimes after receiving an invitation, we can mobilize a team within weeks. Other programs take longer to plan. 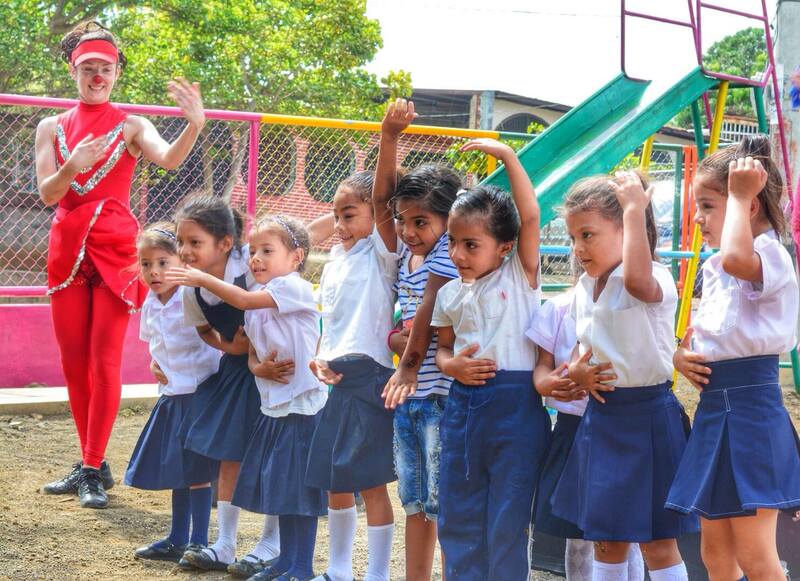 In August, we will be performing in Guatemala, for those impacted by the recent volcano eruption. What can I do to support these kids? We are inspired by the words of our project partner, Chris Cambises, of Refugee Services Texas: “If you are feeling feeble, take comfort in knowing that from Fairbanks, Alaska, to Miami, Florida, and everywhere in between, there are Refugee Services Agencies. Every community has refugees in it, along with organizations to support those people. You don’t have to look far to get involved.” Click here for more information about refugee resettlement in your state. 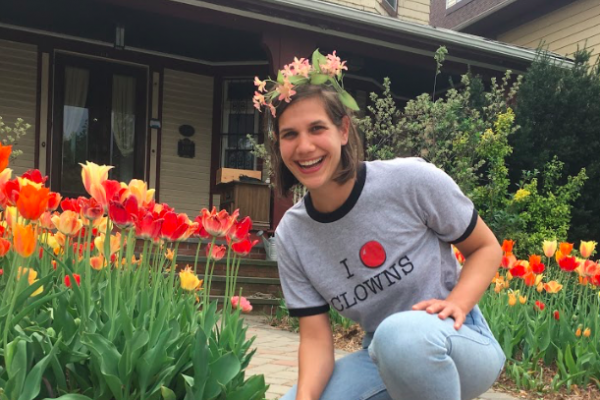 Clowns Without Borders USA is thrilled to welcome Naomi Shafer into the role of Executive Director! It is an honor to be the Executive Director for Clowns Without Borders. For the past three years, my work with CWB – USA has been a source of inspiration, challenge, and joy. I’m humbled to continue advancing the organization’s mission, inspiring resilience through laughter. I am lucky to have worked with all of CWB – USA’s past Directors. Their continued relationships with the organization is inspiring. As we plan for the year ahead, on one of the questions we ask is, “how do we offer support in this time of protracted displacement?” Many refugees, asylum seekers, and internally displaced people will never be permanently resettled. Over 65 million people face the uncertainty and inequity of displacement. Each of those people has the right to play, to dream, to laugh. It’s a privilege to share laughter with these populations and to learn from their resilience. Since accepting the Executive Director position, I have had the privilege of getting to know more of the supporters who make this work possible. In addition to the volunteer artists who you know through their blog posts and tour photos, CWB exists thanks to hundreds of people in less photogenic roles. From the local fixers who help us find bottled water, the web-developers who troubleshoot our technical glitches, the travel agent who finds the best deals, and the lawyers and accountants who donate their services, our behind-the-scenes help is endless, and immensely appreciated. Thank you for your support! Thank you to everyone who takes the time to send us a comment or question about our work. I can’t wait to get to know you better. 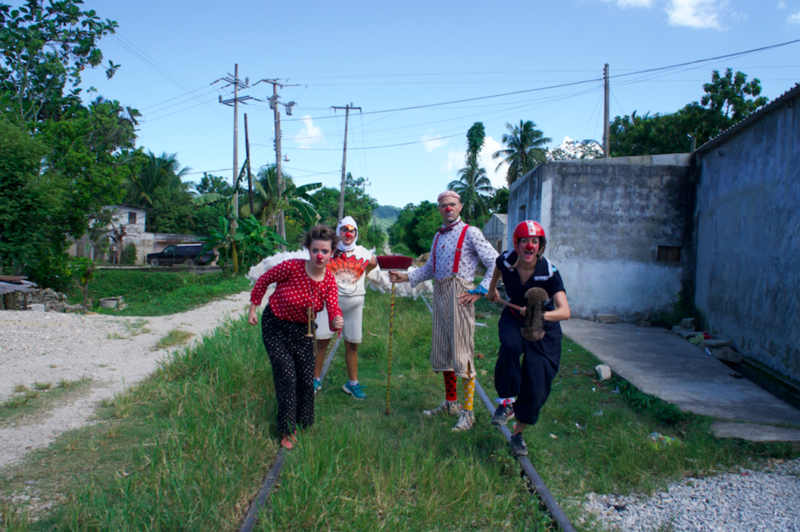 Clowns Without Borders is shaped by its volunteers and often, we talk about how these professional artists share their performance skills. Today, we want to tell a story about a very different type of volunteer. 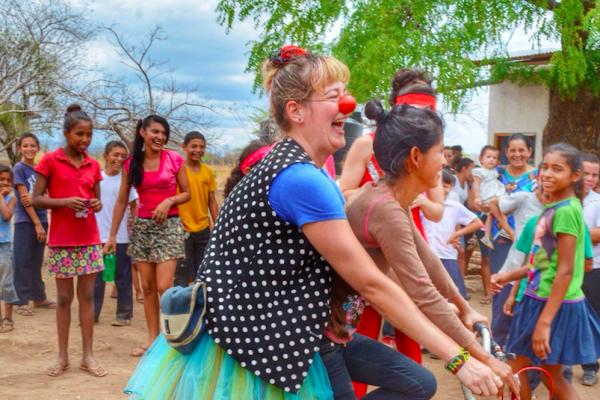 Five years ago, Molly Levine started volunteering with Clowns Without Borders USA in the office. Since then, she has filled many different roles, including Executive Director, and played a critical in role creating a long-term vision for the organization. Part of her vision was to evolve CWB from a volunteer-run organization to one with staff, as we are today. In addition to championing the strategic growth of the organization, she attended to the details of coordinating our tours. Molly is the person who, with grace and patience, waited on hold for hours when flights were missed or baggage lost. She worked with each artist to make sure they were supported before, during, and after tour. Whether the issue at hand was homesickness, heartache, or bellyache, Molly made herself available. 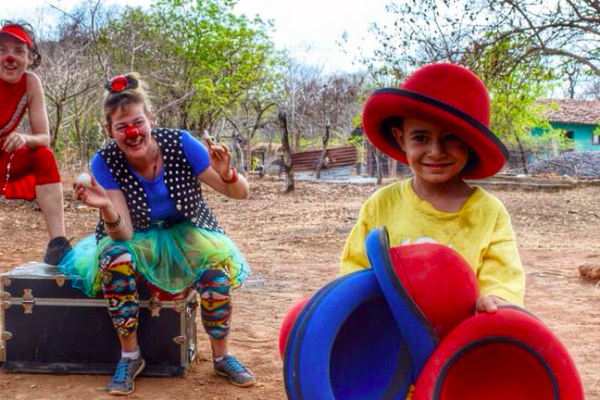 In addition to serving CWB – USA, Molly has also been a valuable asset to Clowns Without Borders International. Through her participation in the General Assembly, she helped create a shared emergency response protocol, among many other contributions. Sarah Liane Foster, current CWB – USA board member and CWBI representative, shares that Molly listened astutely across linguistic and cultural boundaries to people from 12 different countries, and held space in which everyone felt heard and understood. Today we are honoring Molly because she has accepted a stupendous new job, and is stepping down from her role as Program Director. We have learned so much from Molly, who can often be heard saying, “Collaboration is greater than competition,” and “Rising tides lift all boats.” Molly epitomizes these adages in all of her work. We can’t wait to see what she does next, even as she continues to support CWB – USA as an advisor during this transitional period and beyond. 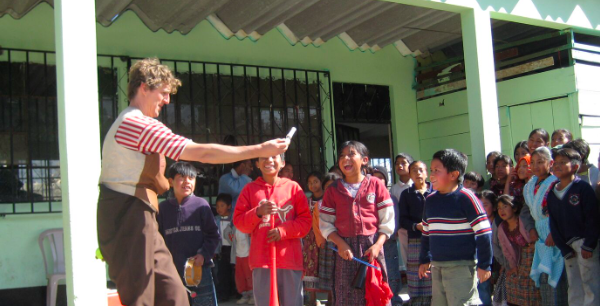 Clowns Without Borders USA is honored to announce that we will tour to Guatemala later this year. On June 3rd, Volcán de Fuego erupted, annihilating a golf course and the village of San Miguel Los Lotes. Ninety nine people are confirmed dead, with at least 200 still missing, as rescue workers continue to search for survivors. CWB – USA received a message from a local partner, asking us to come for an emergency tour to the region, and we are thrilled to make it happen. We are still in the early stages of planning this tour, and will continue to update as more details are confirmed. Thank you to our members, donors, and volunteer artists for their ongoing support, allowing CWB – USA to be as responsive as possible in times of crisis. 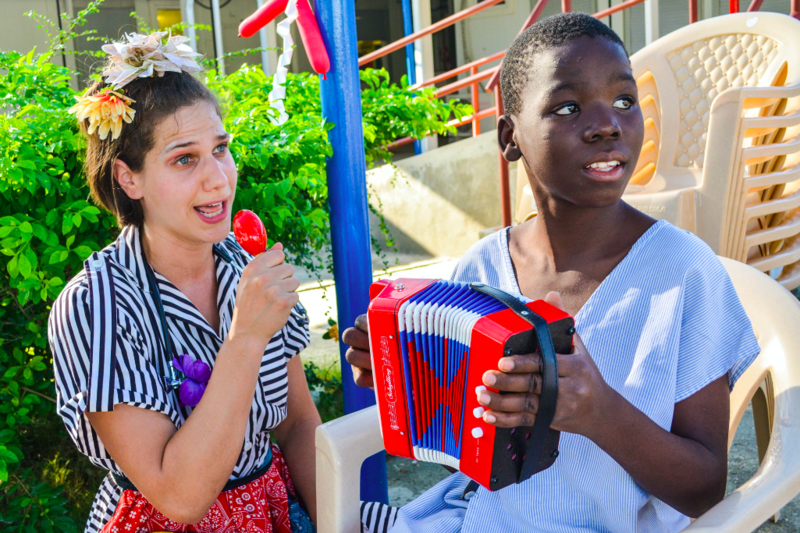 Clowns Without Borders USA recently wrapped up another fantastic membership drive, and since members provide the backbone of our organizational funding, it’s a great moment to look at how CWB – USA spends money. We’re often asked how we do so much with so little. The answer is, with hundreds of thousands of dollars of in-kind donations in the form of volunteer work, plus the generous monetary donations of members, board members, granting organizations, and individuals. Even with that, money—or lack thereof—is a big part of organizing our tours. For our early 2018 tour to Puerto Rico, CWB – USA proposed a budget of 8,130USD and came in at 7,093USD, $1,037 less than anticipated. It was gratifying to see just how far we could stretch our funding and how much joy we could spread. It was also exciting to see Molly Levine blow through her fundraising campaign, raising nearly three times as much as her original ask. Asking for money is never easy, which is why we make sure to be transparent about how we spend it. As with all of our tours, paying local people for their services and getting our clowns to the project location makes the bulk of our expenses. But no matter how much it costs to get people to Puerto Rico (or any project location), the payoff is infinitely greater. Travel is often our biggest expense. In addition to airfare, we purchase emergency insurance for each performer. For this tour, we also had to pay baggage fees for each performer. We work with a travel agent, which adds an extra $30 per person. Transportation looks different during each tour. 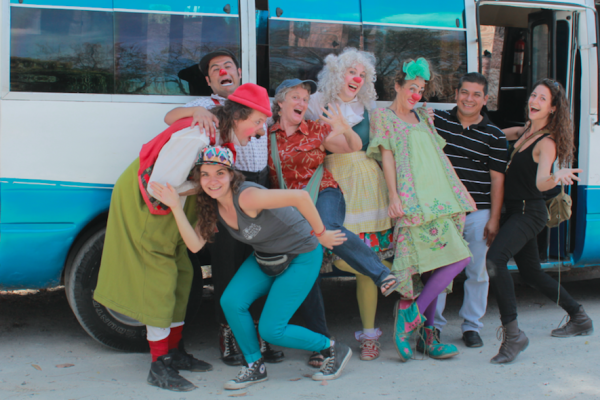 In Puerto Rico, we partnered with a local artist who had his very own circus van! We were fortunate enough to have him as our driver and collaborator. CWB paid for all of our fuel and tolls. We paid a stipend of $400 to account for the wear and tear that invariably occurs from using his vehicle as a green room/dressing room/home away from home. 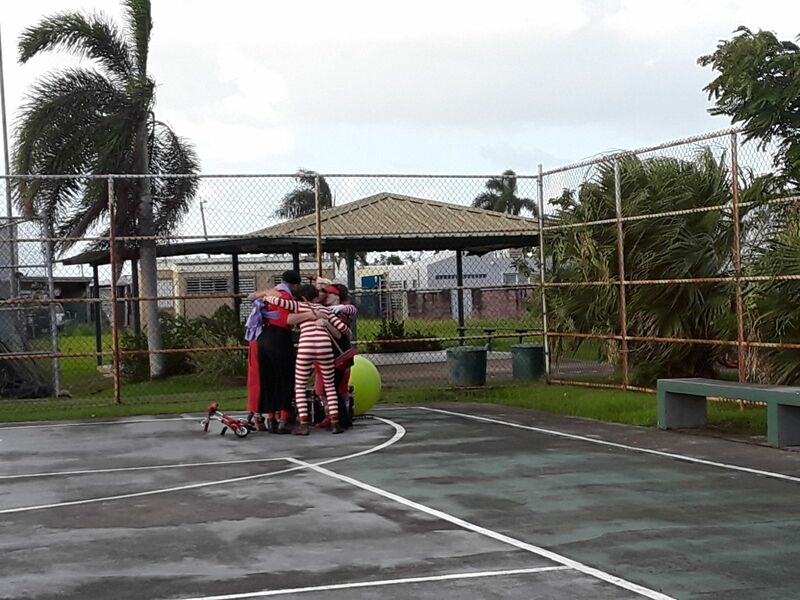 We prefer to spend our housing money within the local community whenever possible, and in Puerto Rico we were able to rent accomodations in a family home in Bayamon, a suburb of San Juan. Our host, Monique, dreams of creating a healing sanctuary for people visiting or completing projects in Puerto Rico. Our financial contribution paid for her to repaint the house, continuing to fix up the damages she suffered during the hurricane. We were able to hire Monique to cook typical dinners for us each night. We paid Monique a stipend to prepare our dinners, and then we ate whatever she felt like cooking. This was such a gift, and allowed us to always finish the day with a nourishing meal. We saved a lot of money, because groceries are much less expensive than restaurants! After starting our days as early as 5am, performing multiple shows, and driving up to five hours, we were grateful to come home to Monique’s home-cooked meals full of love and the flavors of Puerto Rico! Food is always the bulk of our expenses on tour, and this was no exception. We came in $200 under budget on food, largely because of our snack experience! Since we knew we’d be having long drives, with short breaks between shows, we prepared ourselves with lots of snacks. Our early mornings started with a stop at a panaderia for coffees and a little breakfast, which normally come out to just a few dollars. We were often generously gifted with meals from our partners or communities where we performed, and on several occasions we had the pleasure of sitting down for lunch in a small town at a typical, family-style restaurant (when we were weren’t too busy with hard boiled eggs or eating the snacks gifted to us by the schools, on the way out of our performances). We fondly came to refer to our trip as the Huevo Duro Tour (the Hard Eggs Tour). A few additional dollars were spent on things like socks, t-shirts, broomsticks (Clown Antoine broke two over the course of the trip) and shoe glue. As you can see, the cost breakdown demonstrates that this tour was not only relatively inexpensive, but remained so because of the generosity of our local partners, our host, and our colleague who donated his van. By working in collaboration, we’re really able to stretch our dollars. When we network within our communities, we find the best prices while also supporting locals in a way that feels equitable and respectful to everyone. We know that the more we work in this way, the more we can stretch our dollars to create even more programming. Thank you thank you thank you to all of our partners and collaborators in Puerto Rico. It’s an honor to reflect on how our money flows directly to our partner communities! Want to see how this compares to other tours? Check out the breakdown of expenses from our tours to El Salvador and Haiti. 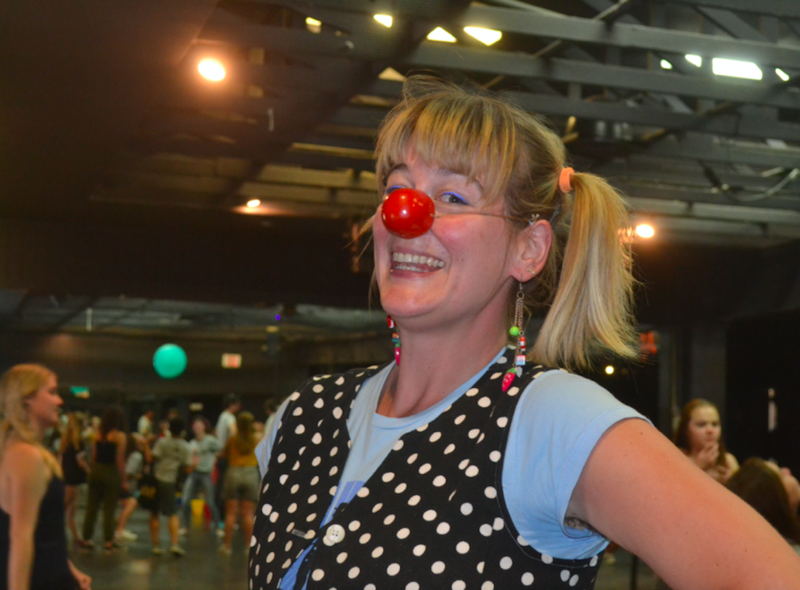 CWB – USA board member Kolleen Kintz reflects on what it means to wear a red nose. When I put on my red nose, the world gets brighter. It’s like the static frequency of the radio tunes in a bit more clearly, and suddenly…there’s music. There’s something about donning the nose that sharpens the senses. I experience a heightened level of awareness and a deep feeling of connectivity with the people around me. More than anything, my desire to play is awakened. The red nose itself is an invitation to play. A friend and mentor of mine, Dody Disanto, will say in her workshops, “Ok, time to get your FUN out of the shoebox under the bed!” We all long to play, and some of us have let a little more dust settle on our shoebox than others. I believe it’s the role of the clown to invite play. That sense of joy and wonder, and the nose, are tools by which to do this. I put on my nose and I’m ready to be an ambassador of fun. 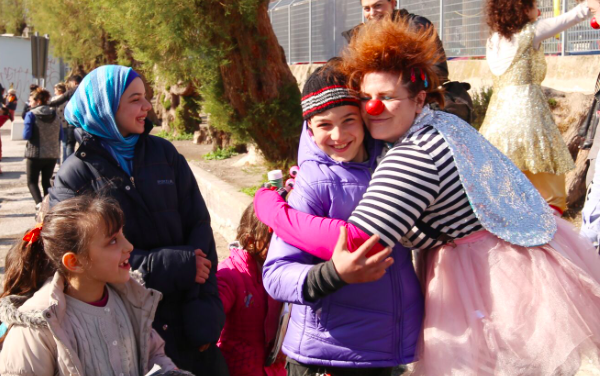 When volunteering for Clowns Without Borders, the communities we interact with are often recovering from natural disasters or living somewhere like a refugee camp. Children are the first people to lose their rights in situations like this. They lose the right to be a child. A clown performance might offer an hour of escapism for a four-year-old living in fear, and remind her of her capacity to experience joy. The same experience can have a profound effect on the parent of this child, getting to see their little one laugh again. I have witnessed this incredible transformation while spending time looking at the world through my red nose. While the nose is a mask, the smallest mask in fact, it is all about amplifying the natural facial features and expressions of the person wearing it. The human being does not get lost behind the clown nose—rather, their humanity is amplified because of it. I often feel in touch with my truest self while wearing a red nose. For me, so much of being a clown is about building relationships. Even if these relationships might be short, spanning the length of a performance, or an afternoon, they are deep. When I’m wearing my nose, I feel like people are more willing to let me into their world. This might mean sharing a meaningful glance with a child during a performance, offering my hand to a teenager as they climb onto their friend’s shoulders in an acrobatics workshop, or it could be as simple as listening to someone who needs to share their story. I feel it’s ultimately the red nose, and my open heart, that helps foster the trust for these relationships to exist. 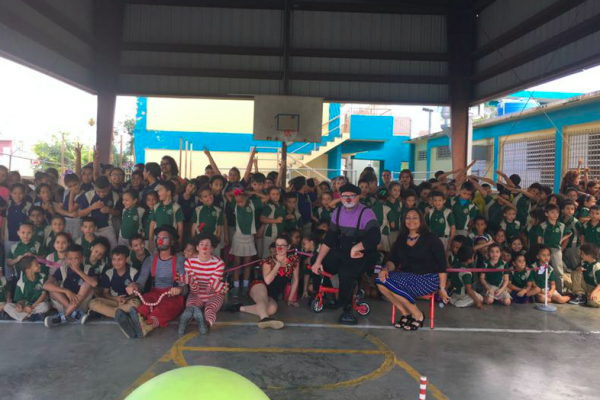 Clowns Without Borders – USA toured to Nicaragua in 2016, in partnership with FUNDACCO. Nicaragua is the largest country in Central America, but is the second-poorest in the region, after Haiti. The distribution of wealth is extremely unequal, and many Nicaraguans survive on remittances sent by family members working abroad. The country features heavily in U.S. history, thanks to repeated episodes of U.S. interventionism and destabilization, beginning with occupation by U.S. Marines at the turn of the 20th century. 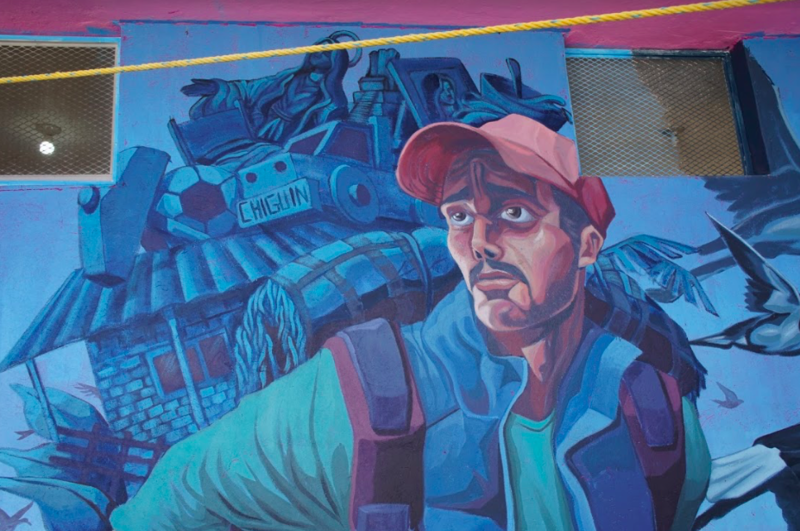 In 1979, the Sandinistas took power in Nicaragua. U.S. President Carter agreed to provide aid to the country with the stipulation that it would be suspended if it was found that the Sandinistas were supporting other revolutionary groups in Central America—and the aid was swiftly suspended after the Carter administration claimed Nicaragua was supporting insurgents in El Salvador. Right-wing groups called contras formed in opposition to the Sandinistas, and were provided funding, arms and training by the CIA under President Ronald Reagan. The contras engaged in a reign of terror against rural Nicaraguans, while the U.S. disrupted shipping to the country and imposed a full trade embargo. Evidence from the Iran-Contra scandal showed that the Regan administration continued to financially support the contras, even after the U.S. Congress prohibited ongoing financial support. The 1990s saw a tradeoff of power, as the Sandinista government lost several elections After a constitutional change, former President and one-time Marxist revolutionary, Daniel Ortega (who had previously served between 1984–1990) was able to run for a fourth term. He won by a landslide in 2011. But, in April, 2018, people took to the streets to protest increased taxes and pensions cuts. Independent press in Nicaragua estimates that at least 63 people have been killed and over 400 have been wounded as part of the protests. After the first eruption of deadly protests, President Ortega announced that his administration was scrapping the unpopular tax plan. But protests have continued, morphing from criticisms of the tax plan to condemnation of the Ortega government. The President and his wife (who is Vice President) attributed street violence to “criminals,” while describing the protesters as a “minuscule” group. However, business leaders have begun to back the protesters, an unusual move in any anti-government movement. Indeed, the protests are viewed as the largest popular uprising in 30 years. The past few days of public dialogue, mediated by the Catholic Church, have not gone well for Ortega, as protesters interrupted him with accusations of murder.